If you search on the internet “someone figured out my password”, and look for “images” – you should see a few examples of a poster with a picture of a forlorn looking dog and the caption “Someone figured out my password, now I have to rename my dog!”. Cats don’t find this funny either. Trying to get people to take IT Security seriously is like pushing water uphill sometimes. . . until something happens. I stopped by the reception desk in one of our buildings this week and whilst I was there, somebody came along and handed over an iPhone that had been left on a chair. The receptionist said that this was a regular occurrence – I hope at least it had a pin number on it. Then, she produced a biscuit tin full of USB sticks that have been found lying about. How many of these contain the only copy in the world of somebody’s dissertation, or worse some confidential information? 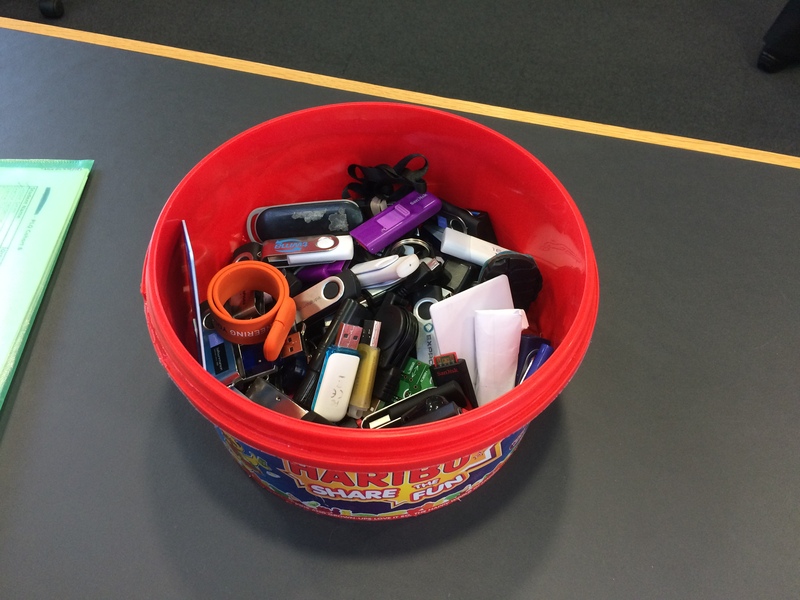 USB sticks in a biscuit tin – is yours there? Recently, the worst passwords of 2014 have been announced. The good news is that the word “password” has at last been knocked off its perch as the most common password. The bad news is that it has been replaced by “123456”. They make a guess that you might, just might, use the same password at work – bingo, they’re into the University finance system. Far fetched? Well, something very similar to that scenario happened in one organisation that lost a 6 figure sum of money as a result. Now that I’ve kept your interest to this point, I’ve just revised the University’s policy on use of IT Facilities. Please read it – it’s there to help everyone use our facilities safely and fairly, there’s a very short introduction to the key points, it’s not rocket science and it won’t take you more than a few minutes. Wow, where does the time go? I’ve been quiet on the Blog since start of January, so am picking things up again. I thought I would share a bit about our student facing review of IT Resources, but first an update on WiFi. In any case, WiFi came up regularly as a topic when we met with student reps. IT Services, along with the manufacturer, have completed a substantial programme of work in January and February to look at the WiFi system and reconfigure it to resolve the key problems people have been experiencing with connections. I’m pleased to say that most if not all of the feedback now is that this has brought a substantial improvement to both staff and students. The IT Help Desk are now getting hardly any calls, and we can see a steady high load of successful connections to WiFi across the Campus. As ever in these situations, there can still be a small “tail” of people who might have unusual problems, or something specific to their IT Account – if you are still experiencing any difficulty with WiFi access please do contact the Help Desk. Don’t be stuck – they are there to help you! Back to the Student Facing Review. As part of our ongoing programme of quality enhancement, the University engages with students to take their input to help us improve non-academic support services in the University. This year, we decided to involve students in looking at IT resources across the University and we have also involved SPARQS (Student Participation in Quality Scotland) who are helping us in our approach and also keen to see how we get on. We kicked the process off with a series of focus groups in December involving student representatives, and we also attended a meeting of the “Big Student Forum.” It’s been great meeting up with them – we have very committed and involved student representatives, and the feedback from each of the focus groups has been consistent which has helped us to draw up some priorities. We also held a couple of further focus groups in February to involve the student reps in designing possible solutions to some of the suggestions they had made. Next step is to bring all of this together into our forward planning to create an action plan. 1) WiFi – and hopefully we have made good progress in addressing that now. 2) Printing support. Students like our print solution, but are looking for more rapid support, information and help when there are problems with the printers. 3) Access to Computing Facilities. Across the Campus there are open access facilities, and also IT labs which are partially timetabled and available outwith that. Students want better information on which IT spaces are free and when. 4) Information and Communication. Some students were unaware of valuable IT facilities available to them, and overall induction and communication emerged as a key theme which probably applies beyond IT. 5) Storage for student files, and how best to access such storage on Campus and off Campus. 6) Access to help and support. Students give great feedback on Help Desk support but they find it restrictive having it physically in one place on Campus (other than peak times when we do “popup” help desks). We’ve discussed a number of possible options to create more flexible access to support. There’s lots more I could say on each of these topics even at this stage, but we’ll take some time to shape them up in more detail and then share progress on the blog.